Pioneer DJ introduces today its new DJM-900SRT four channel DJ mixer with built-in sound card for native control of Serato DJ software. DJs also get new gear at Musikmesse, with Reloop debuting the RMX-80 Digital mixing console. 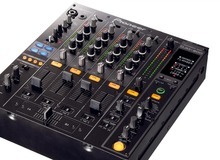 Pioneer introduces the DJM-750 4-channel DJ mixer with built-in USB sound card, available in black and silver finishes.